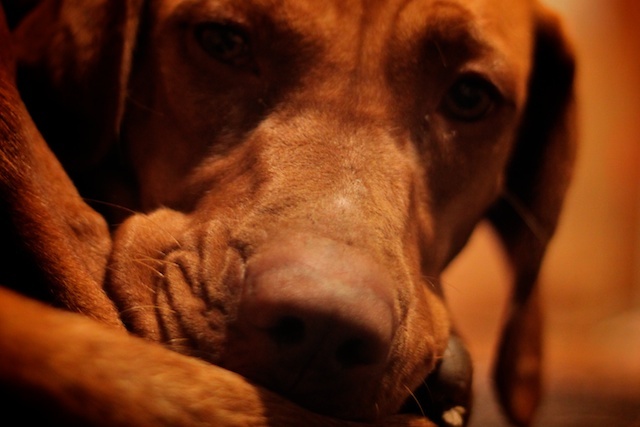 Meet Újhold, the Hungarian Vizsla that became our temporary roommate for the night. Our friend Franky found her wandering unattended in the Penny Market parking lot. He is a sucker for all dogs, but especially Vizslas since he has a very loved and sorely missed Vizsla of his own back in the United States. It’s little surprise then, that everything she did reminded Frankie of his own dog, Luna. He even christened her Újhold, a possibly rough Hungarian translation of New Moon. He couldn’t leave the parking lot without knowing she had a place to sleep, which turned out to be the foot of our bed, since Frankie’s not allowed dogs in his building. I’m not the hugest fan of dogs, though I have to admit, she was a perfectly polite guest. The real question is, does anyone know her owner?